Little Office of the Blessed Virgin Mary: Behold Your Mother By Matthew Russell S.J. Part 10. The "Memorare" in Various Forms. 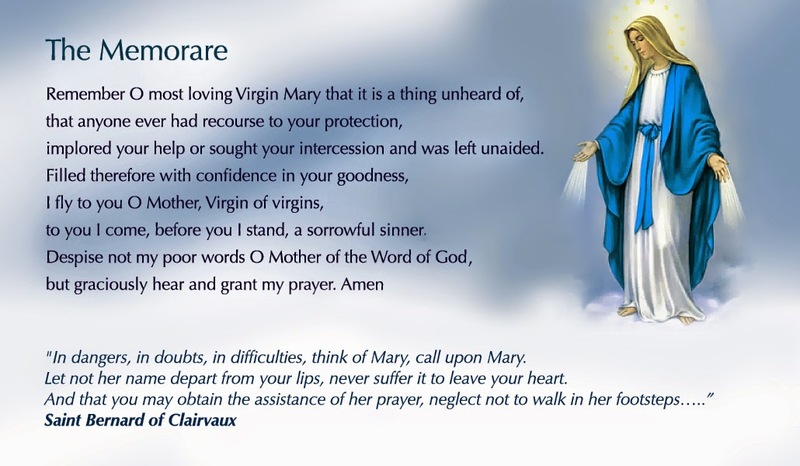 I remember with pleasure that I heard a somewhat Bohemian Irishman call the Memorare the finest outburst of prayer that he was acquainted with. I hope he has repeated it occasionally since then, for his surroundings have not been of the safest. God help some poor young men who think themselves greatly to be envied. I have looked in vain for some discussion of the authorship of this prayer. As the Anima Christi is often called the Prayer of St. Ignatius, though it was in use hundreds of years before St. Ignatius was born, so it is certain that "the Memorare of St. Bernard" is a misnomer. But St. Ignatius in his Exercitia Spritualia makes us repeat constantly the Anima Christi, and so was the propagator, though not the author, of this prayer: what connection has St. Bernard with the Memorare? "Memorare, 0 piissima Virgo Maria, non esse auditum a saeculo quemquam ad tua currentem praesidia, tua implorantem auxilia, tua petentem suffragia, esse derelictum. Ego, tali animatus confidentia, ad Te, Virgo Virginum, Mater, curro; ad Te venio; coram Te gemens peccator assisto. Noli, Mater Verbi, verba mea despicere, sed audi propitia et exaudi. Amen"
Pope Pius IX., by a rescript of the Holy Congregation of Indulgences, dated December 15 1846, granted an indulgence of three hundred days every time we say this prayer, and a plenary indulgence to those who say it every day for a month, to be gained on any day they choose, on the usual conditions of Confession, Communion, visiting a church and praying there according to the intention of the Sovereign Pontiff. V But it is curious that exactly the same indulgences had been granted less than three months before (September 23, 1846) for the recitation of the same prayer with sundry omissions and additions. In the English translation of the Raccolta, however, published in 1857, by Cardinal Newman's specially loved and trusted friend, Father Ambrose St. John, we find that the common Memorare was in reality first in the field, being indulgenced at the request of Cardinal de Bonald, Archbishop of Lyons, July 25, 1846; but this was at first for all the faithful in the kingdom of France only, and not extended to the whole Catholic world for ever till the following December ii, 1846, "at the prayer of several ecclesiastics and persons of consideration in Rome.'' What is the history of this rival of the Memorare, which Father St. John calls "the prayer Ave Augustissima" from its opening words ? 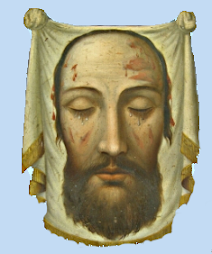 "AVE, augustissima Regina pacis, sanctissima Mater Dei, per sacratissimum Cor Iesu Filii tui Principis pacis, fac ut quiescat ira ipsius et regnet super nos in pace. Memorare, o piissima Virgo Maria, non esse auditum a saeculo quemquam tua petentem suffragia esse derelictum. Ego tali animatus confidentia, ad te venio. Noli, Mater Verbi, verba mea despicere, sed audi propitia et exaudi. O clemens, o pia o dulcis Virgo Maria. Amen." "Hail, Empress, Queen of Peace, holiest Mother of God, by the Sacred Heart of Jesus thy Son, the Prince of Peace, cause His anger to cease from us, that so He may reign over us in holy peace. Be mindful, Mary, tenderest Virgin, that from of old never hath it been heard that he who asks thy prayers was forsaken of God. In this lively trust I come to thee. Cast not my words behind thee, Mother of the Word; but in thy loving kindness hear and do, gentle, tender, sweet Virgin Mary." "Remember, Mary, tenderest-hearted Virgin, how from of old the ear hath never heard that he who ran to thee for refuge, implored thy help, and sought thy prayers, was forsaken of God. Virgin of virgins. Mother, emboldened by this confidence, I fly to thee, to thee I come, and in thy presence I, a weeping sinner, stand. Mother of the Word Incarnate, O cast not away my prayer, but in thy pity hear and answer. Amen." "Remember, O most tender-hearted Virgin Mary, that never was it heard of in any age that anyone who ran to thy protection, implored thy help, and sought thy intercession, was ever abandoned. Inspired with this confidence, I run to thee, O Virgin of virgins, my Mother! And left to his despair. Who does not pity find. None, none, O Holy Mary ! As Mother to us all. I run with trustful fondness. Like child to mother's knee. See at thy feet a sinner. And let me stray no more. No more! O H0Iy Mary! Thy Son has died to save me. For even such as I. How slow and frail to do. And help me, O my Mother! Most loving and most dear. Help, help, O Holy Mary! Fond Mother, close to thine! Sweet sharer in the world's Redemption-pain! Where none came yet in vain! Was left to plead alone. Be broken first for me. A weeping sinner unto thee I cry. Sweet Mother of the Word Incarnate, hear me! May e'en my halting words efficient prove! And let my sore distress thy pity move. The "Memorare" voiced his soul's request. In every age since Christ the Saviour's birth. The echoes of an echo, we repeat it. And grant it, Mother, in thy home above. Remember, remember, O Virgin Mary! That never ascended the wail of anguish. From the noisome earth, through the clouds of darkness. Without finding balm at thy radiant throne. O Mother of Pity, to thee I come ! My feet are weary, my hands are numb. Where His mercy shines with a fadeless light. "What shall bring yon forward in the narrow way, if you live in the world, but the thought and patronage of Mary ? What shall seal your senses, what shall tranquilize your hearty when sights and sounds of danger are around you, but Mary ?" Emu de cat espoir, o Reine glorieuse. Attend de vous la paix et son bonheur perdu. Aupres de votre Fils qui regne dans les cieux! The longest of all the poems founded on the Memorare appeared in the Irish Rosary for June, 1907—five stanzas of eight lines each, by a Dominican Father, who disguises himself (alas ! too effectively for many of us) by giving his name in Irish, D. B. an Crataig, The letters c, t, and g in this name are "mortified" and so are we at our invincible ignorance of the grand old tongue which reverences the Blessed Virgin Mary so much as to pronounce her very name differently from other Marys.